Description: A beautiful and important map of the Eastern coast in rich original colour and embellished with ships and two ornate cartouches. Description: Miniature map of Eastern Canada and Greenland with a surprisingly accurate depiction of the Great Lakes. Coloured. Title: : Le Canada, ou Nouvelle France, &c.
Description: Attractive and early map of Canada's eastern coast. Published by the "father of French cartography". Coloured. Description: Eastern Canada and Newfoundland. Important map of the country based on Jesuit sources. The cod fisheries of the Grand Banks are particularly well-surveyed. Strong impression. 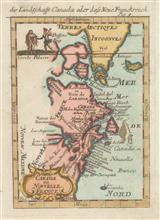 Title: : Carte Particuliere de L'Amerique Septentrionale ou sont Compris le Destroit de Davids, le Destroit de Hudson, &c.
Description: Miniature map of Canada (New France) and east coast United States down to Virginia and Bermuda, with decorative native figures. Coloured. Description: East coast of Canada. Includes Nova Scotia and Newfoundland. Coloured. Description: Nova Scotia. Coloured map of the region using the former French name, Accadie (Acadia). 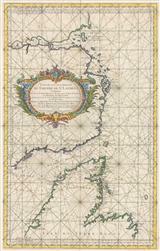 Description: Sea Chart marking St. Anns Bay around Fort Dauphin, one of the oldest settlements on North America. Coloured. Description: Early sea chart of Nova Scotia with detailed coastline of Placentia, Newfoundland. Coloured. Description: Hudson Bay and environs. In reference to the British quest for a Northwest Passage, the note in the upper left corner notes that "the English seek a passage in this part but it does not exist". Coloured. Description: Coastal chart of the Gulf of St. Lawrence featuring Newfoundland, St. John, and Cape Breton. Coloured. Description: The mouth of the St. Lawrence River to Quebec with other early settlements marked in red. Coloured. Description: Town plan of Louisbourg, Nova Scotia, an important French settlement and fort established in 1713 and captured by the British in 1758 during the French & Indian War (Seven Years' War). Coloured.